Mexican-style food is staple on the menu in my kitchen. I rarely go a week without preparing burritos, quesadillas or taco salad. I’ve had a lot of practice preparing Chicken Fajita pizza because I used to make it quite frequently before I started the 52 Pizzas Project. Andrew’s graduate school advisor visited us for dinner tonight and he seemed pretty open to eating any type of pizza so Andrew requested this one because we haven’t had it in a long time. While having a new pizza every week is great, one of the downsides is we don’t often make time for repeats of our favorites. I think I’ve mentioned before that I am not very confident when it comes to cooking meat, especially chicken, and it often comes out dry and over done. This habit of mine is improving and tonight the chicken turned out pretty tasty and was juicy when I shredded it with a fork. 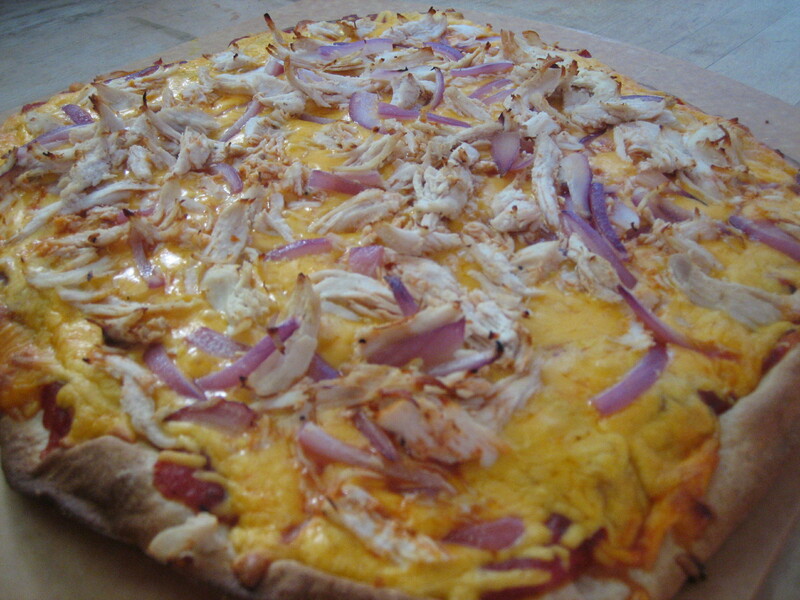 I spread salsa and marinara on the dough, topped it with cheddar cheese, shredded chicken and sautéed red onions. This was a fantastic repeat and still one of our favorite recipes. We had a night of good food and great company. This entry was posted in cheddar cheese, cheese, chicken, marinara, Meal->Pizza, meat, Onion, salsa, sauce, veggie and tagged chicken fajita, chicken fijita pizza recipe, pizza. Bookmark the permalink. I will attest that it was a friggin AWESOME pizza! And there’s something about the dough… SUPER AWESOME! Thanks Lance! And I will attest that the company was awesome as well. I really enjoyed spending time with you, hopefully again soon!